Palestinian Legislative Council MP with PFLP indicted for 12 security crimes, including inciting for abduction to free jailed terrorists. An indictment was submitted at the military criminal court at Ofer Prison located north of Jerusalem on Wednesday against Khalida Jarrar, an MP on the Palestinian Legislative Council (PLC), who was charged with 12 counts of security-related crimes. Jarrar is a senior member of the Socialist Palestinian Arab terrorist organization Popular Front for the Liberation of Palestine (PFLP). Last August, she was served an order banning her from her home in Ramallah over security threats, but she disobeyed the order and was arrested on April 1. An administrative detention order was placed on her for six months, in parallel to her ongoing investigation. 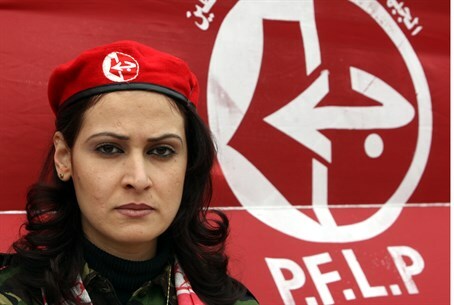 The indictment attributes 12 security crimes to her, including being a member of the banned PFLP terrorist group, holding an administrative post in the PFLP, as well as conducting a series of public activities for the PFLP. It also accused her of inciting to abduct IDF soldiers so as to negotiate the release of jailed Arab terrorists. Among the terrorists she sought to free was Ahmad Sa'adat, the leader of PFLP, who was sentenced to 30 years in jail in 2008 for heading the terrorist group. Sa'adat was accused of planning the 2001 assassination of Tourism Minister Rehavam "Gandhi" Ze'evi, which was committed by four PFLP terrorists in Jerusalem; the Palestinian Authority (PA) has lauded Sa'adat on numerous occasions for the murder. The military prosecutor will ask to keep Jarrar in jail until the end of legal proceedings. The PFLP, founded by Dr. George Habash, used to specialize in plane hijackings. Its most infamous attack was the 1976 hijacking of an Air France plane, diverting the flight to Entebbe, Uganda. The passengers were later rescued in a daring IDF raid, in which Prime Minister Binyamin Netanyahu's brother Yonatan was killed while commanding the elite operation.